Damon Richardson, in a classroom at LIFT, using the app Codex: The Lost Words of Atlantis. "It was a wonderful success. I had people come to me and ask me how it works." Educator Corey Clark, student Damon Richardson and educator Diane Gifford. Clark and Gifford, from SMU, are members of the award winning team People For Words that created the Codex mobile app. As many as one-third of Dallas adults are barely literate. Each year, literacy groups only reach 1.5 percent of them. But now there's an award-winning smartphone app designed to change that — and it's free. Dunn's granddaughter set her up at Literacy Instruction for Texas, or LIFT. All the students at a recent LIFT class shared two things in common with Dunn: low literacy and the dream to read. Otherwise they're different. Damon Richardson, for example, finished high school. At 25, he’s a lot younger, and he wants a college degree. But Eastfield College said he wasn’t ready. “They told me they would send me to LIFT to improve on my math and reading skills," Richardson said. "Because during that time, it was on the fourth-grade level." 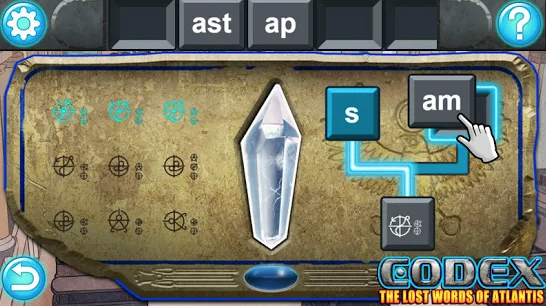 A screenshot from the literacy game Codex: The Lost Words of Atlantis, available in the Google Play store. He's taken classes at LIFT for four years now. He says people there teach him to read instead of shaming him because he can't. They introduced him to the new literacy phone app called Codex: The Lost Words of Atlantis. "I did try out the app. And then you know, it does teach you about spelling, words and sounds," he said. The Codex app works so well, it just co-won the $2.5 million XPrize Literacy award. The team behind it is People for Words, made up of educators from LIFT and Southern Methodist University. The challenge — create a smartphone app that helps adults learn to read. SMU’s Diane Gifford, who designed the app, says you can’t assume adults students always remember what they learned as kids. “They needed to go back just to that letter sound correspondence in order to move forward," Gifford says. "You can’t move forward if you have missed a critical piece of information. "" So the application teaches those basics. “Now it’s saying the letter 'p,' so it’s very important for you to hear the sound. And it’s saying 't' as in 'tee' ..."
... which can be tedious. That’s why Codex is an adventure game that takes players around the world. Users advance by learning and using the right letters, words and sentences. For this game to win the XPrize, users had to advance rapidly. Non-English speakers ran into a road block. They could pronounce the words but didn’t know what they meant. "And so we went back and actually modified the game to have a hidden object," said SMU’s Corey Clark, who's on the Codex team. "Now we have visual depictions of these words. Clark says doing that helped app users advanced a whole grade level. That progress was required for a shot at the $7 million XPrize. For Damon Richardson, he advanced two grade levels. "It was a wonderful success," Richardson said. "I had people come to me and ask me how it works." People For Words will put some of its $2.5million prize into improving Codex — and use some of it to celebrate. More than 36 million adults nationwide lack basic English literacy. A team from Southern Methodist University and Literacy Instruction for Texas are hoping to help chip away at that number with their award-winning phone app. Adults learning to read in Dallas will help test apps designed to reduce illiteracy. It’s part of a global competition to develop mobile applications aimed at adult learners. Dallas is one of three cities nationwide involved in field testing. On Tuesday, Dallas Mayor Mike Rawlings helped launch the local field test.